US Wellness Meats Review. Before you purchase your organic meat essentials, I suggest you read my ultimate US Wellness Meats review and useful US Wellness Meats money saving tips first. Before I share with you my US Wellness Meats Review, I wanted to share with you, what my life was really like BEFORE I discovered a healthier way of life. This picture below was taken of me on my 31st birthday, today as this post is published is my 37th birthday. Making the picture below 6 years old today. In the picture above, I weighed in at 16 stone 5 pounds (229 pounds/104.1kg) and was asking for diabetes or any other weight related health problem. I ate out of my fat fryer too much, had too many processed foods in my diet and generally was old before my time. Fast forward 2 years and I had discovered Paleo and dropped 5 stone and now weighed in at 10st5 (145 pounds/65kg). My life was back on track and I felt truly amazing. Paleo is the result of that and it’s amazing whenever I have non-Paleo foods how rubbish I feel. But one of the biggest problems (as a follower of Paleo) is finding quality products for a reasonable price to have in your diet. I love the products for sale on Thrive Market and particularly love Bobs Red Mills from there. BUT when it comes to the food from the farmers shop, I have a real struggle. Of course, there is Butcher Box and you can read our Butcher Box Review here, but Butcher Box is very limited on product choice and that is why I was over the moon when I discovered US Wellness Meats. It is the full shop version of Butcher Box or the Butchers version of Thrive Market. 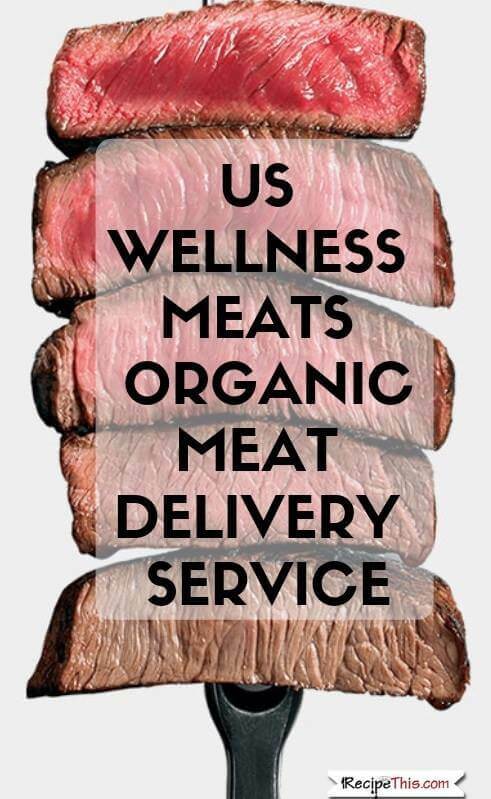 US Wellness Meats is a meat delivery service that goes beyond just selling organic meat door to door. It is so much more than this. Think of every butcher shop product you would want for the Keto, Paleo or general healthy diet and they have it. Unlike joining Butcher Box, you can buy what you need when you need it. You are not tied to buying a monthly box and it is more like shopping at Thrive Market. You explore the website which is easily organised into different categories and see what is right for you or for your family’s budget. There is literally something for every budget. It is not like Breakfast At Tiffanys when all you can afford is a jewellery alternative. Instead at US Wellness Meats you will be spoilt for choice. Though just like Butcher Box you can have everything you ordered, shipped directly to your door. US Wellness Meats is all about the products. So, let’s have a virtual tour of what products US Wellness Meats offer and see what amazing deals you can get on your organic meat and general farm shop products. I am always dragged in the direction of the best sellers whenever I visit a website. I always find myself there on Amazon when looking for new DVD ideas and the same can be said for any type of online shop. You want to know what other people get excited about. I would take all the best sellers at US Wellness Meats but the ones above are my personal favourites. A big section at US Wellness Meats for me must be all the little things that you can buy from there. You normally must go to one place for your jerky, another for your pork rinds and then somewhere else for your healthy chocolate. But at US Wellness Meats they surprised me by having everything in one snack section. There are lots and lots of them, but those ones are my personal favourite. As a nut hater, I have found a lot that doesn’t involve nuts in their snack section. But if you miss your cookies, your chocolate, your hot chocolate while on Paleo, then you will be in heaven on US Wellness Meats and it will be a case of what to have first! There is just so much choice at US Wellness Meats, that is hard to tell you where to start or which sections to visit. But the special diet section is well worth a note. For me that just about covers all the diets that people are on these days and of course, you know that it is going to be high quality and good for you. I love the fact that you can get Paleo Pizza Crusts as we all know what an effort, they are to make our own, or to be able to source sugar free bacon. The meat range at US Wellness Meats is HUGE and you could be like a bull in a China shop, wondering where to start first and wanting to try EVERYTHING. When I buy from a butchers online, my first thought is to grab the meat that is hard to source locally. A MUST before you hit checkout at US Wellness Meats is checking out the sale section. There you can choose from the best deals they currently have and grab yourself an AMAZING bargain. You can also pick up ghee butter and cheese from US Wellness Meats and I wonder if you shop here and a farmer’s market for your vegetables, if you even need to visit a regular grocery store again? I decided to ask one of my readers to try out US Wellness Meats and see what he and his wife thought of them. He lives in Michigan in the United States and is naturally an Aldi’s shopper so I can’t wait to see what he thinks of organic meat and produce. When the order came through from US Wellness Meats, it was received from UPS. Everything was frozen solid and needed quite a thawing if you wanted any of it for dinner that day. You can simply throw it straight in the freezer for later. Every item is well marked in heavy duty bags and everything was well organised. Every item I cooked was incredibly tasty and I would eat all of them again given the opportunity. It’s been said that salt is the spice of life and I believe this to be true. So that being said, the pork rinds have very little salt, so very bland tasting. My only complaint about the entire US Wellness product range that I tried. Variety is the spice of life. There is so many products to choose from that you would be spoilt for choice. Healthy diets covered. I loved the fact that they had so many organic products that were perfect for Paleo, Whole30 and Keto. Fast delivery. Delivery was fast and efficient with UPS. Tastes amazing. The flavour of the meat and how tender it is, will have you coming back for more. You get what you pay for. The prices are very reasonable considering you are having the best ever organic meat delivered to your door. Fantastic packaging. Everything is well packaged and labelled. Place your order in the freezer and then get out the meat as and when you need it. Weekly deals. US Wellness Meats bring out a regular weekly newsletter with special deals so that you can get the best offers. Excellent customer service. I have worked with a few of the assistants at US Wellness Meats and you really get an amazing service. Flexibility. I love the fact that I can order what I want and when I want it. No monthly subscription and I can go in and bulk buy monthly if I want to. Or I could just grab the latest sale item. Good sized cuts. The meat is all packaged perfectly ready for the freezer. No need to get your butchers knife out, let US Wellness Meats do the hard work for you. RecipeThis.com Opinion: We recommend that if you are fussy over what meat you eat then you MUST try out US Wellness Meats. The prices and the quality of the produce is truly spectacular and for a company that has been providing Paleo and Primal meats for 19 years, they are trusted by many too. Buy From US Wellness Meats Today! I recommend that you give US Wellness Meats a go. Even just to try it out and see if it lives up to the great reputation it has. There is so much choice, it is like the organic Butchers shop that you never knew that you had.